Key Difference: Software refers to a set of programs which is capable of performing some specific tasks on a computer system. They can be broadly classified into two categories - System software and Application software. Software refers to computer programs which perform specific functions as instructed. It can be a single program or may refer to a number of programs collectively. These instructions are defined in proper step by step manner. It is important to mention that hardware becomes incapable for extending its capabilities without support of the software. These software programs assist computer systems and network to start and work. 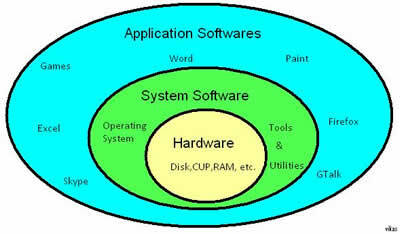 Operating system – It is a well-known example of system software. This software interacts with the hardware and provides the capability for running various types of programs. Desktop uses operating sytems like Windows, Linux and MacOS, whereas Android and Windows are commonly used operating systems for mobiles. There are different types of operating systems like real time, distribute, embedded, etc., It is necessary to consider the hardware specifications before deciding the operating system. Language translators – It includes assemblers, compilers and interpreters. These programs have been designed for programming languages like C, Cobol, Pascal, etc. Machine language is translated into machine code with the help of an assembler. Compiler translates the code written in a high level language to a lower one. An interpreter is capable of executing programs directly. It executes the program in a line by line manner. Common Utility Programs – These programs are designed specifically for managing the computer device and its resources. It includes programs like communication tools and disk formatter. They are more focused on the operations of computer infrastructure. For example – Virus scanner is a kind of common utility programs which provides protection to the system from unwanted guests like Trojans and viruses. Word Processors – These software programs are used for creation of documents. In addition to basic activity of creating a document, it also assists in storing and printing that document. Changes can be easily made in the document through these word processors. It is one of the most commonly used application software. MS-Word is an example of a word processor program. Database software – This software is capable of creating databases. In addition to it, it also manages the data or information residing inside the database. It is also known as DBMS sometimes. They help in organizing data. Some of the examples of database software are Access, Oracle and Sysbase. Multimedia software – These software have been devised to work with different types of media which are connected with each other, they are usually used in multimedia presentation. Education and Reference Software – Theses software have been devised in order to assist in learning about any specific thing. There are many different types of tutorial software programs which fall under this category. Many of these software programs have been designed for children for assisting them in their learning. They are also known as academic software. Ultimate Maths Invaders and My Amazing Human body are too such software. Graphic software – These software programs assist in working with graphics, as it enables the user to edit or manipulate visual images. It includes image editors and illustration software. Adobe Photoshop and Corel Photo paint are two popular examples of graphic software. These types of software usually work on either bitmap or vector images. Web Browser – This is a software program which is used for locating and retrieving files or resources on the World Wide Web. Internet explorer like web browser comes integrated with the operating system. Mozilla FireFox is another example of an application software program. It is an open source and multi-platform software. There are many other types of application software programs like – Enterprise software, spreadsheet software, Information worker software, Simulation software, games, etc.